We did a double take too. 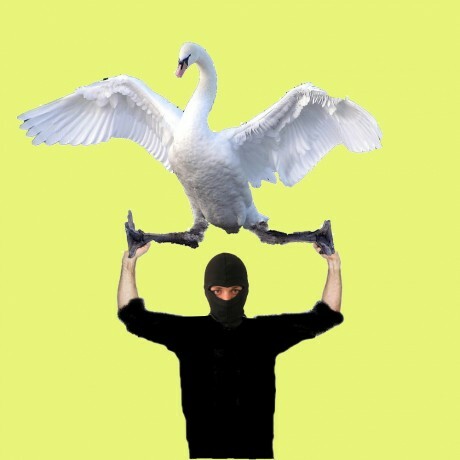 According to Der Spiegel: the assailant, a Mr. Sebastian P., grabbed a passing swan from the bank of the River Munich by the neck and wielded it like a club, repeatedly striking his victim with the feathery armament. His victim, an east German tourist identified as Steven L., was not harmed in the altercation, nor was the winged billy club used in the beating. The assault weapon flew away unharmed. Now you can write this off as random drunken Germans beating each other with the most convenient hitting implement, or you could take a closer weirdthings look. We believe this was no mere drunken shenanigan. Mr. Sebastian P. was obviously a very skilled practitioner of the ancient Japanese martial art of Swankuri. Why Swans? Think about it, swans are the perfect weapon. They are easily trained, heavy and dangerous when wielded by a professional. They are all terrain and easily transported (they cans swim and fly). And best of all, they blend in with their natural surroundings so your victim is none the wiser, until you open up a can of whoop-beak on em and by then it’s too late. Then you simply put the swan down calmly, walk away, and watch your murder weapon fly off into the sunset, setting off for it’s next post. ….But seriously….a swan…come on Munich. As far as weird news goes, Germany is like the world's Florida.